Hello there! I hope all is well with you and your yarn :). We have had quite a relaxing week around here. Last weekend we had Monday off for MLK day so it was a great three day weekend, went to work Tuesday through Thursday, Friday was a snow day! Can’t get better than that :). I should clarify…we live in North Carolina so it wasn’t much of a snow day as it was an ice day although we did get about an inch of snow. Since the entire town shuts down for events such as this we’ve been shut in since yesterday and I must say it has been nice. I was able to finish up my Angel Cloud Afghan and now will be able to officially use it just in time for this cold weather! This afghan is crocheted using a granny ripple pattern with Lion Brand Homespun Thick and Quick yarn. It’s super soft makes up a thick luxurious blanket. 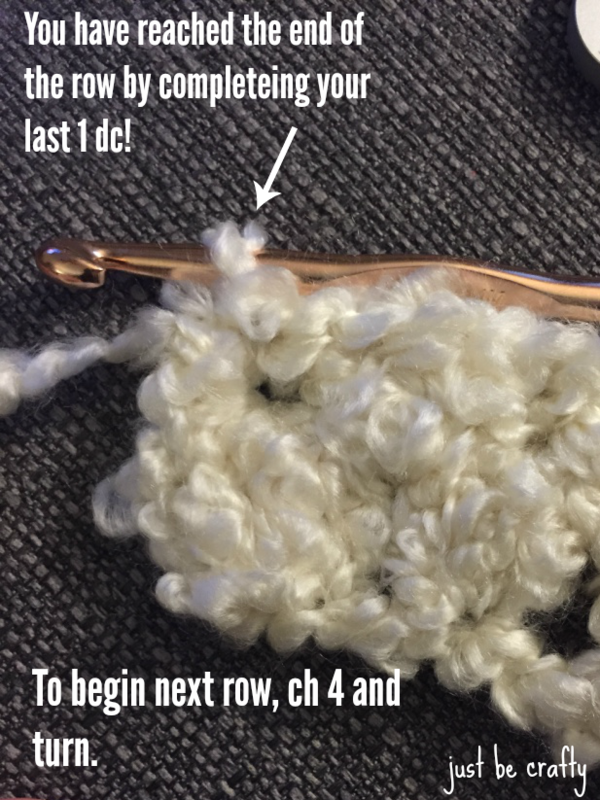 This was my first time using this yarn, and although the first row was a little difficult because it was hard to distinguish between each individual chain and crochet into the correct one to get started, it was smooth sailing starting in row two. See this post for a Granny Ripple Tutorial with regular worsted weight yarn! Repeat from * 5 more times; (3 dc, chain 3, 3 dc in the same space), skip 2 chains, 3 dc, skip 2 chains, 3 dc, skip 2 chains, 4dc in the last chain, turn. 1 dc in the chain space of the row below. Repeat row 2 until you have used up all of your yarn. Cut yarn and weave in any ends. Very pretty and super instructions! Thank you for sharing. THANKS !! GOING TO MAKE THIS ONE FOR SURE. LOVE THE NAME. I’d be interested to know what are the dimensions of the finished piece, and if you want to make a baby afghan, would you just make everything half size? Don’t understand on row 1 when it says repeat* 5 times is that what’s in () or that plus the remainder of row 1? I hope that helps! If you have any more issues please let me know! Hi Brittany, thanks for the pattern!! I have a question on row 2. 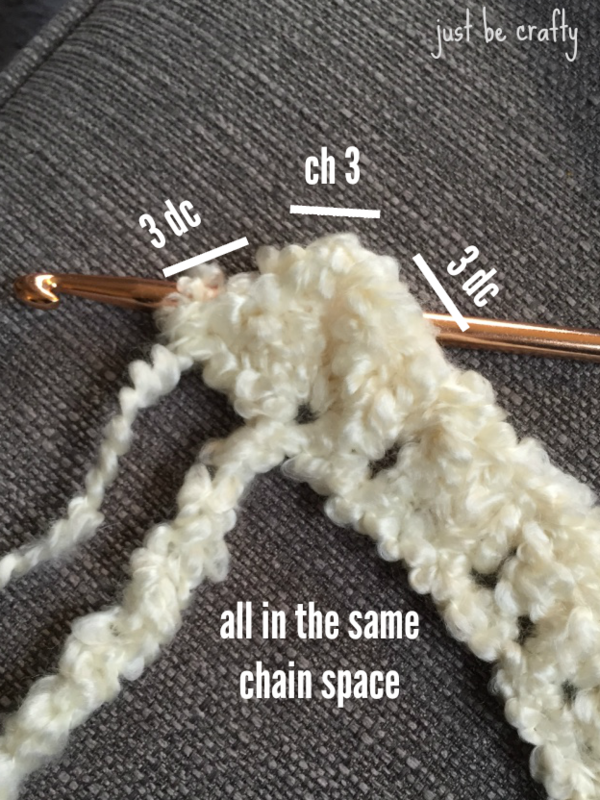 I am somewhat new to reading crochet patterns. So I chain 4, then I do 3 dc in the next chain2 space from the previous row, then I do 3dc on the next chain2 space again? And I do this 2 more times? A total of 4 times? Or is it just telling me how many times I would do in total? Which is two. So I do no chains between the 3dc I. Chain2 spaces? I just jump from one to the other? Thanks! Hi Jeanette! Yes you are correct, you will chain 4, then complete 3dc in the next space (created from the previous row). Then you will complete 3dc in the next two spaces, for a total of 3 times. (I adjusted the pattern, as I had written it out in error) At this point, you should now be at your first ‘peak’ where you complete 3 dc, chain 3, 3 dc all in the same space. And yes, you are correct, there are no chains between spaces. Once you hit row 3, they are no longer the “chain 2 spaces” of the previous row, but little gaps created by the previous row. I hope this helps and if you haven any other questions please let me know!! Actually, row 3 is not exactly the same as row 2 because row 1 is different from row 2 so I have a question. When you turn to do row 3, you chain 4 but there are four gaps instead of three. The first one is right next to the chain4. Do I skip this gap or do I do 3dc in this gap right next to the ch4? Do I keep skipping above the chain5 sections from the first row because row2 doesn’t have ch5 sections anymore; and at the end of the row, do I do 3dc on the space where 1dc was done on row2 because the hole is bigger or do I do 1dc still? Sorry so many questions! I am so excited over this pattern! Thank you so very much. The main reason I’m so excited, is that I am a Newbie at reading patterns. simple single stitch from a friend, and anything else was on me. about halfway done after starting at 7am, and I have arthritis in my hands/fingers. see if the other colors look as elegant as yours! Hi Lynette! I am so glad you are enjoying the pattern, you just made my day! I’d love to see your afghans or partial afghans! 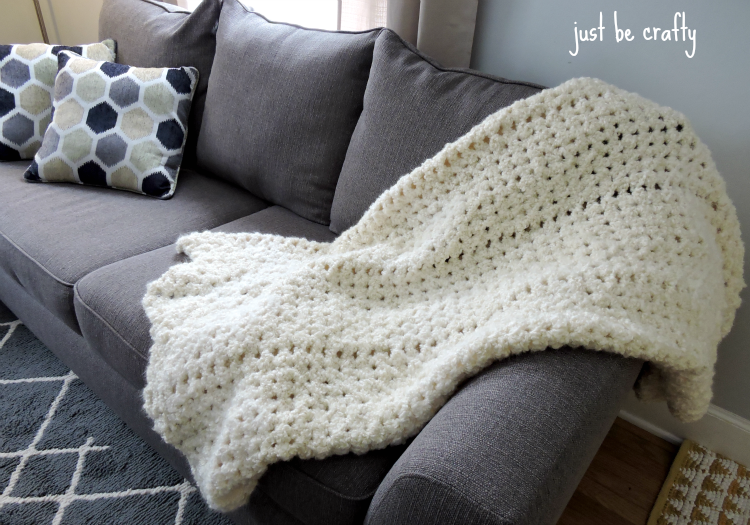 Feel free to share a photo of your blanket on the Just Be Crafty Facebook page!! 🙂 Happy Crocheting! 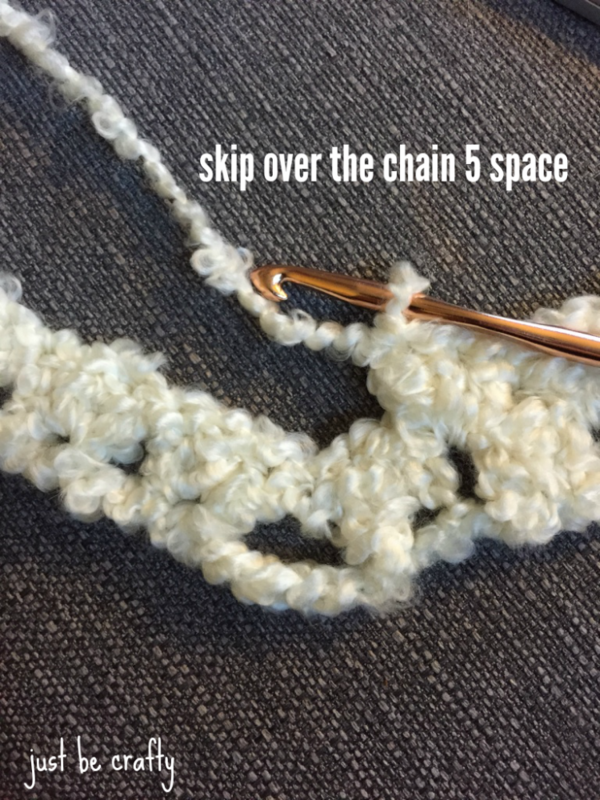 I’m wanting to make this a lapghan – what number should my chain be a multiple of? Is there a way to print this out as a PDF? I have some other patterns that have button for that. But I don’t see one here. I tried to copy and paste it into Word, but the photos get mixed up. Hi Luana! 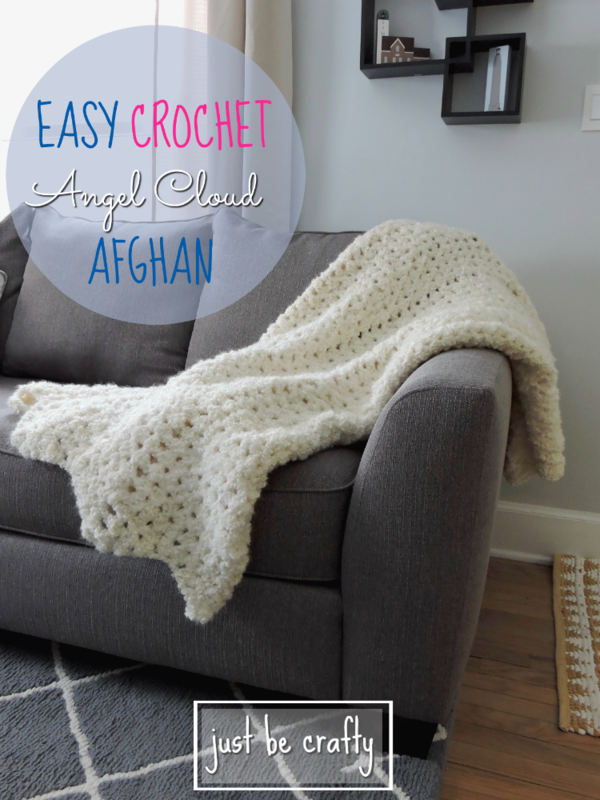 I do not currently have a PDF version of the Crochet Angel Afghan at this time. 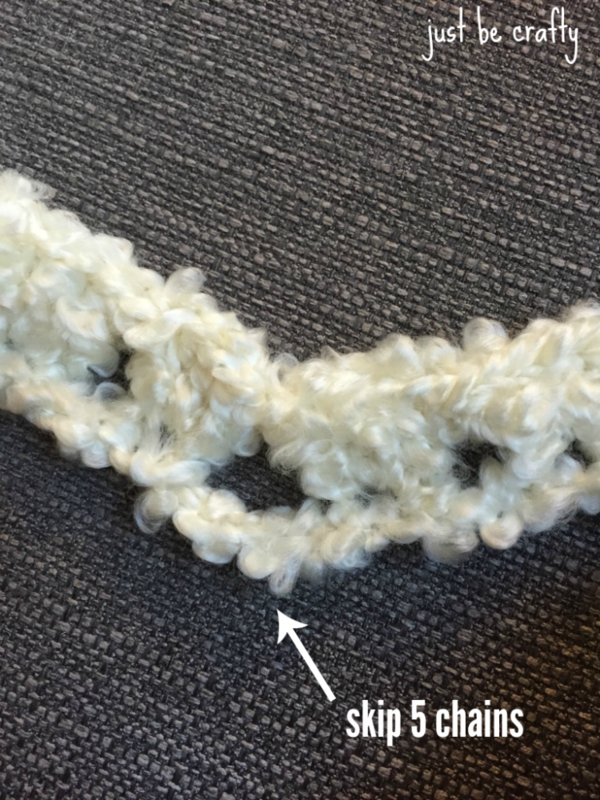 Is there a way to show this is plain yarn in order to SEE the stitches better? Hi Marilyn! I am hoping to have a new tutorial on this soon. Please stay tuned! What is the stitch count to make bigger or smaller. Thank you for a wonderful pattern. This pattern is worked in multiples of 24. Once you get your multiple of 24, then add on 19 chains to even out the pattern, plus an additional 3 chains. I am having trouble with this pattern. On row 2 I do fine until I get to the part where it says to “skip over the 5 space of the previous row”. This is the peak of the chevron, and I don’t know how to skip over it without leaving it just sticking up unconnected. Help! Thanks! I have started over 3 times now, and still end up with the same problem! I am super excited to try this. From your pictures I see exactly what you mean by row 1 being very difficult in determining where the stiches are. I’m subscribing so I can follow you. Looking forward to many more awesome patterns. It seems a great idea is to make a lust for us! If we are doing a lap pad. Baby blanket or full throw just tell us what to chain!!!! That would be awesome in all your videos and instructions!! That would make you more thorough than anyone on youtube!!! I need baby afghan!!! Great Grandbaby due!!!! Thanks!! Hi Jo! Thanks so much! All of my patterns are written in US crochet terms. Happy crocheting!